The largest aviation group in Africa, Ethiopian Airlines has confirmed it will take delivery of its 100th aircraft next month. Yes, the pioneering airline will receive a Boeing 787-900 on 5th June 2018, the 1st for an African airline to operate 100 aircraft fleet in the history of the continent, thus maintaining its pioneering aviation technology leadership role. 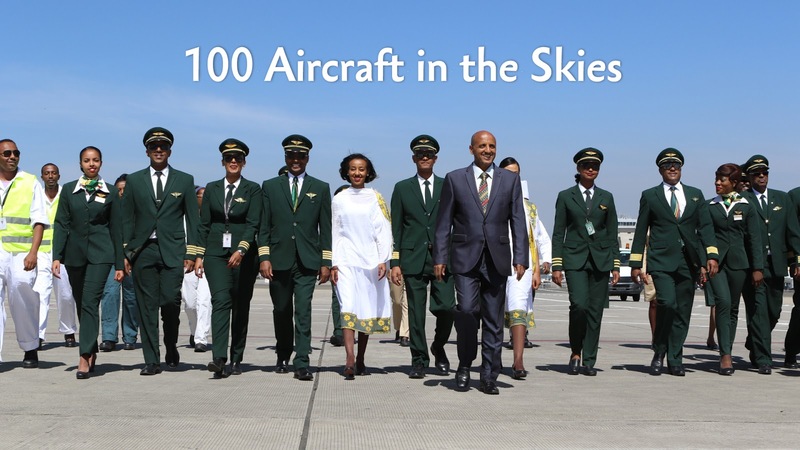 Ethiopian Group CEO, Mr Tewolde GebreMariam said: “It is an immense honour for all of us at Ethiopian to reach the milestone of 100 aircraft. This milestone is a continuation of our historical aviation leadership role in Africa and a testimony of the successful implementation of our fast, profitable and sustainable growth plan, Vision 2025." Ethiopian was the first African airline on the continent to use jet aircraft back in 1962, it operated the first African Boening 767 in 1984, the first African Boeing 777-200LR in 2010, it was also the first African carrier to fly the new 787-800 Dreamliner as well as the first to operate the Airbus A350. Ethiopian now boasts one of the youngest fleets in the sky, not only in Africa but also globally, with an average age of less than 5 years. The fleet modernization coupled with rapid route expansion is part of the groups 'Vision 2025' strategic development process which has seen its network grow to over 110 international destinations over 5 continents. 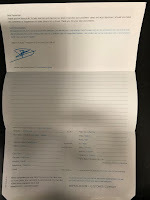 "This 100 fleet milestone, which we have achieved ahead of our Vision 2025 targets, compels us to revise our plans with a view to phase in more aircraft and further expand our network so as to meet the growing travel needs of our continent and support its economic development and integration by facilitating the flow of investment, trade and tourism. We will continue to connect more and more Africans with their fellow citizens of the continent and with their brothers and sisters in the rest of the world to make life better every single day” Said Tewolde GebreMariam. 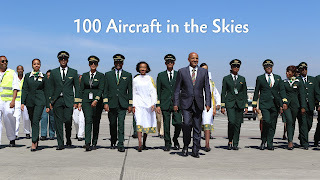 Ethiopian's fleet will continue to rise wat above the 100 airframes in the not too distant future, for it already has 5 more Boeing 787-900's as well as 16 Airbus A350's on order and there could very well be more orders before the end of the decade.